Pardon the blurry slide. I guess that’s what happens to slides when they sit in a shoebox for 48 years. 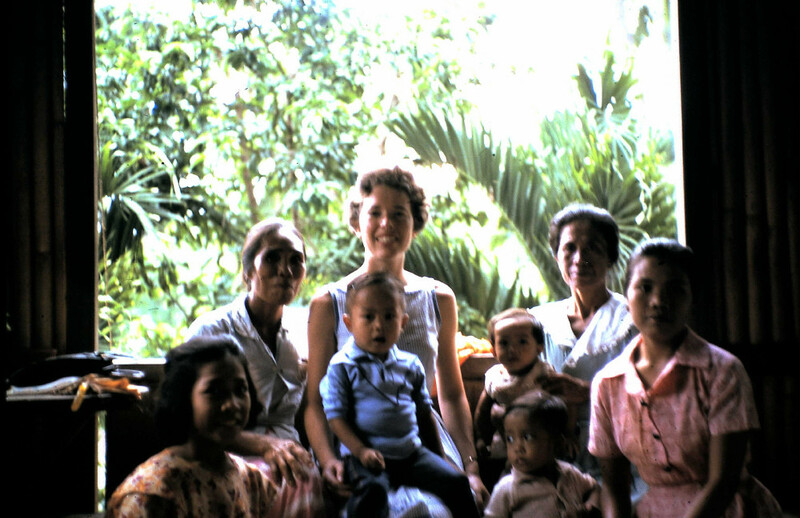 The summer between my mom’s junior and senior years at Smith College, she traveled to the Philippines with a group of college students led by a former US Navy civilian. The group spent three weeks together in Manila, meeting Filipino politicians and journalists. Then each student was placed with a family in another part of the country for three weeks. After that, the group met up again to travel around the Philippines for three more weeks (followed by a short visit to Tokyo and Hong Kong). This slide shows my 21 year old mother and the family she stayed with for those three weeks in La Union, a province on the South China Sea. I love the lush palms in the background and the open window, especially as I barricade myself indoors on this snowy and 10 degree Fahrenheit day.